November 3, 2011 November 3, 2011 Nickolene1 Comment on SEO: What Is It & How Can I Use It? SEO: What Is It & How Can I Use It? As a public relations student, you typically encounter the lovely three letter acronym SEO, or Search Engine Optimization. But what is SEO and why is it important in PR? SEO is based off of a basic principle that the first pages of websites seen through search engines will have the most visitors and citations in the future. Basically, when you search on sites like Google, those first few pages of content receive the most online hits. SEO is essentially a way to manipulate your content for maximum search potential. Search engine optimization is significant as a Public Relations employee because you may be involved in analytics or Internet marketing within a company, even though your job title includes Public Relations. This means that one of your responsibilities may be to “optimize” viewership on a specific page. This can be done by analyzing search phrases and calculating the number of viewers that click on a website based on a specific keyword. In analyzing this information, marketers are able to see which keywords and phrases are most frequently searched. Did the PR lightbulb go off? When you know this information, you can cater a website to fit certain phrases that are searched often, thus giving your website a greater chance of being viewed. More views = more PR opportunities. Another way to increase the chances of seeing your website rank highly in search engines is by using links and tags that contain popular search phrases. Companies are hiring SEO consultants and specialists to increase their searchability and chances of being seen on the Internet. As a PR student, it is vital to know the fundamental concept behind SEO and some basic analytics. I know, you probably didn’t choose a math-based major because you don’t like math, but that’s okay. Analytics is less math and more about being able to look at data and form basic recommendations based on what the data says. And as PR students, it is crucial to be able to do this. You are doing PR for a gourmet chain of groceries in and around New York City. The owner of the grocer wants to brand themselves as the premier grocer for gourmet, homemade, artisan goods in NYC. By using SEO techniques, you can ensure that when someone googles for “New York artisan grocery,” the client is as close to the top as possible. You do this by making sure that phrase is used to describe the company online (through inbound links), by writing posts with the phrase “New York artisan grocery,” and by making sure that the press release includes the phrase, “New York Artisan Grocery,”. These is just one simple way to utilize SEO. Another feature of SEO is the long tail strategy, which sounds much more complicated than it is. Imagine you are looking at a chart consisting of all the search terms for your website. Although there is a peak with a common search term, most of your views come from the less popular or more specific search terms. 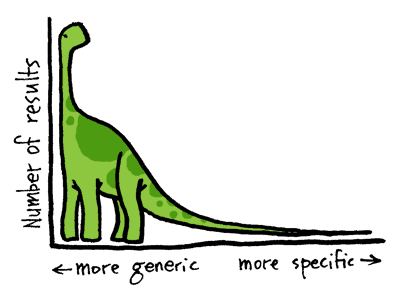 The terms are known as the “long tail” of your search. In order to make sure that this strategy works for you, tag, categorize, and specify your website’s content. It is also a good idea to put some general information about your company on each page (such as a boiler plate).